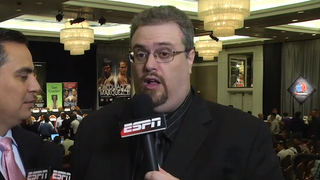 Dan Rafael is the most important boxing journalist in the world, merely by dint of being the only full-time boxing correspondent at ESPN. He has access—to fighters, to promoters, to fans—that other writers could only imagine. He has 70,000 followers on Twitter; few other full-time boxing writers can claim more than 5,000 (Rafael's supremely talented ESPN.com colleague Kieran Mulvaney has fewer than 3,000). He gets regular airtime on SportsCenter, Friday Night Fights, and on other high wattage ESPN programming. His loyal army of "fight freaks" are such passionate fans that middling boxer Joel Julio—whom Rafael once jokingly dubbed his "Love Child"—actually wears the letters "LC" on his trunks to salute them for their support. It's easy to like Dan Rafael. I like Dan Rafael. Dan Rafael is a pretty good boxing reporter. But Dan Rafael is certainly not the best boxing writer in the business. Not even close. The intellectual heavyweight of all boxing writers is the incomparable Thomas Hauser. Graham Houston, who covered his first fight during the Kennedy administration, is its grand old man. The fiery young guns are guys like Ring Magazine's Dougie Fischer, and Maxboxing's Steve "K-9" Kim. Outstanding websites like The Queensberry Rules and Bad Left Hook regularly feature top-notch reporting from a variety of excellent writers. Dozens of other regional sports writers, from Ron Borges to Lance Pugmire, have done better work than Rafael on a regular basis. And Gawker's own Hamilton Nolan is the single most brilliantly descriptive writer in the business. He writes about boxing as if it were a sport still worthy of close observation, the way it was in the 1920s, when it was reckoned the proudest, most important test of skill in the sporting world. Rafael, by contrast, stands out for almost nothing other than his remarkable ability not to stand out. The stereotypical boxing writer is a gruff, jagged old rogue with a bad drinking problem, as personified by the late Bert Sugar. Rafael is a supremely inoffensive teetotaler. The most risqué thing Rafael has ever done is to tweet an NSFW screenshot of Carl Froch's exquisite life partner, Rachael Cordingley, after her chest briefly exited her low-cut top during a moment of celebration. (Like I said, I like Dan Rafael.) Rafael's first significant journalistic position was for USA Today, the most inoffensive and milquetoast of all media outlets. He is a committed fan of the New York Yankees, the Duke Blue Devils basketball team, and Kiss, the ultimate rock band for people who do not actually like rock 'n' roll. Even his last name seems to have been Anglicized and sanitized beyond recognition: He pronounces it "Ray-feel." Dan Rafael has achieved his position in life not because of his ability as a journalist, but in spite of it. The late Mark Kram, author of the incredible Ghosts of Manila, once wrote of Muhammad Ali's win-loss record that those kinds of simple statistics, "like bikinis, show more than they reveal." The same could be said of Rafael's writing, which, while always competent, exists only for what it displays on its face. It is near perfect in form, function, utility, and inoffensiveness. Instead of holding his two arms together touching from elbow to wrist in an impenetrable peek-a-boo defense, Santa Cruz tended to allow his elbows to wander outward, so that his arms formed an "A." And at the bottom of that "A," uncovered, was a nice soft portion of Santa Cruz's belly, just above the belly button. And that soft portion of belly is what Zab Judah repeatedly pounded with straight left hands throughout the first round and a half, steady as a metronome, bouncing a double jab off Santa Cruz's gloves up by his face and then bending quickly to hammer that left hand into a belly that had not looked all that washboard-y to begin with and was now being methodically whacked into a soft mousse covering a very angry and aching stomach. Yaegashi-Porpramook had more of a slow build. As each round went by, the bout gradually evolved from an exciting action fight with lots of contact to a wild war. It really heated up in the third round as they blasted away at each other, with the crowd really into it. Of course, there's no need for Dan Rafael to see what Hamilton Nolan sees, or what Thomas Hauser sees, or what Steve Kim sees. His audience doesn't demand it, and his employers would probably discourage it, lest actual passion scare off the almost mythical, and surely skittish, causal boxing fan. But the dearth of visceral writing—so typical of the violent sport of kings—is jarring for boxing fans. Boxing is raw emotion translated into physicality. Rafael's writing is the rubber insulation around that glowing copper wire. Nor does Rafael "break" meaningful stories. He occasionally serves as a vessel through which promoters and other powers-that-be in boxing can leak something that works to his or her advantage; but he does not rake in the muck. He does not ask the tough questions. He challenges neither his friends in the industry, nor his readership. Rafael seems to have advanced furthest in his career by going unnoticed in the background while the others in his platoon expose themselves to fire. His risk-averse nature makes him the perfect choice for a risk-averse multinational company like ESPN. And these characteristics, along with his considerable platform, also make him the perfect choice for a promoter or fighter looking for a sympathetic ear. As boxing prepares for its biggest moment of the year, tonight's showdown between superstars Manny Pacquiao and Juan Manuel Marquez, Rafael's coverage has been predictably superficial. Other writers have devoted extensive coverage to Marquez's suspicious muscle gain and association with a disgraced former steroids dealer, to the prevalence of PEDs in boxing and the disturbing degree of power that promoters now seem to hold over even the very regulatory bodies tasked with keeping the sport clean and safe. Rafael has brought us regular Twitter updates on his shower's water pressure, and a feature article on how Pacquiao and Marquez are basically indifferent to one another. In boxing, this quantity of fluff should exist only in the 8 ounces of padding wrapped around a fighter's hand. That's only a recent example. In 2007, "Sugar" Shane Mosley—one of the sport's most charismatic and popular figures—sought out Rafael to provide an exclusive interview designed to clear his name after evidence arose suggesting that Mosley had used the infamous BALCO designer steroids, "the cream" and "the clear," as well as the endurance enhancer EPO. That interview, which ran under the headline, "Mosley admits he unknowingly took BALCO steroids," was a prodigy of hollow access journalism, a puff piece devoid of any independent thought. From the opening sentence of the article, in which Rafael relays Mosley's claim of being a "health freak" who had "no idea" what he was taking, to Mosley's repeated efforts to cast all blame on his former strength coach, Rafael never once gives the reader any reason to doubt Mosley's self-serving account. But Rafael had good reasons to doubt Mosley. This interview took place in September 2007, only months before the release of the Mitchell Report. PED use was hardly a new story, and "unintentional" ingestion was not a novel excuse. Moreover, Mosley—a high school weightlifter—had a history with bodybuilding supplements. After winning his first title by defeating Philip Holiday in 1997, Mosley blamed excessive creatine use for his somewhat lackluster performance. Mosley had been widely linked to Conte and BALCO since the scandal broke in 2003, although Mosley had steadfastly denied using any illegal products. And, aside from that, Mosley's new account directly contradicted his prior public denials, which in itself should have raised serious questions about Mosley's credibility. There was ample reason for a reporter to question Shane's version of events. And, as it turned out, such scrutiny would have been deserved. That became readily apparent a year later, when testimony leaked in which Mosley admitted to knowingly using EPO under BALCO's direction (a confession that Mosley would repeatedly re-affirm in a videotaped deposition). Rafael chose to confront the issue in one of his popular live chats on ESPN.com. When asked by a reader about the new revelations, Rafael vented, " he lied to all of us, including to me personally. Shame on him." Rafael's indignation, however, was apparently short-lived. When Mosley retired following a loss to Canelo Alvarez earlier this year, Rafael wrote a long profile on Mosley's career. In the profile, Rafael repeatedly touched on the "stain" of Mosley's association with BALCO, but instead of underscoring this "stain" by mentioning Mosley's intentional deception of Rafael and his readership, Rafael took an almost inexplicable turn. Rafael reverted to unabashedly repeating Mosley's narrative of events, and even incorrectly states that Mosley had never wavered from his professions of innocence (the testimony that had previously so shamed him apparently notwithstanding). There is no reason to think that Rafael disbelieved Mosley's questionable account when he first covered the story in 2007, or even that he intentionally ignored Mosley's outright lies when he drew up his career retrospective. Instead, these acts are best viewed as wholly consistent with Rafael's personality. Rafael is simply a writer who desperately wants to believe in the people and the industry he covers, especially when the subject of his story is someone as beloved and powerful as Mosley. His stories seem precision-engineered to please everyone involved. He is someone who so enjoys receiving calls from boxers and promoters on his home line that he often proudly announces to his readership that he needs to take a short break from a live chat because he is receiving a call on his "bat phone." And, of course, he would be far less likely to receive those personal calls were he not so accommodating with his coverage. Rafael is what you get when a sport becomes hostage to television. All of boxing is a working set, and everyone—the fighters, the ringside analysts, the reporters—is part of the cast and crew. There is no place in TV's ecosystem for old rogues and jagged edges and independent thought, and there is no need for close, writerly observation when the readers you're writing for are watching along with you. The writing is smoothed over, conveying nothing fresh or startling, serving only to get viewers up to date on the latest storylines and telling them what to expect on the next episode. Why should it be anything else? No one reads TV Guide for the prose style. None of these shortcomings make Rafael a bad man, or even a bad writer on a sentence-by-sentence level. To the contrary, he is supremely easy to like and to read. But his success is not a measure of his abilities. It is a measure of his timidity and his nearly willful lack of curiosity. And that is a valuable lesson for anyone who equates success with aptitude. Dan Rafael has succeeded not because he reports the news well or with special insight, but because he consistently delivers the news in a way that the boxing industry and ESPN would like the news to be delivered. Whether he is memorable, moving, or even entirely accurate is almost inconsequential. And this is all very sad, not only because boxing desperately needs an honest and powerful advocate to counter the public's perception that it is a hopelessly corrupt and dying sport, but also because it remains a vivid sport populated by vivid craftsmen that cries out for vivid journalism to match. Dan Rafael is the only writer in the business with the platform to do that, but he fails to capitalize on that opportunity every time he sits down to write. For that, shame on him. Iron Mike Gallego is a Deadspin commenter and degenerate boxing fan. Direct all complaints to ironmikegallego@gmail.com or @ironmikegallego on Twitter.